As history has it the original pub that stood where the current Blue Anchor is located was built sometime in the 17th or 18th century. The origin of the name of the pub is not entirely known. 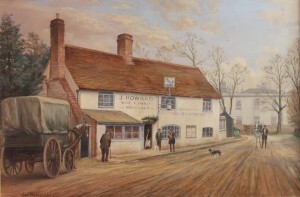 The sale in 1839 described the pub as being previously called “Hollydays”. Interestingly, it also states that the pub had been in existence for a very long time. 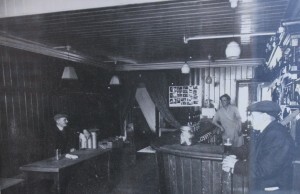 There is a claim that the pub was also formally known as the “Crown & Anchor” due to ships’ anchors being made at the nearby Mill at Byfleet. There are records that the first annual exhibition of the Byfleet Floriculture and Horticultural Society in 1836 was held at the “Anchor” and the Directory of 1845 gives the name as the “Blue Anchor”. Another school of thought is it got its name from the word “Anker” which used to be a name for a measure of wine or spirits, commonly in use in England. At the time of the infamous murder of the pub landlord Alfred Jones who now haunts the pub, the pub was called “The Blue Anchor Hotel”. The origins of the pub can be traced back to 1823 when an illustration was drawn of the pub. This is now on display at the British Museum.